Moist, chewy, crispy, crunchy, ooey, gooey, buttery, nutty . . . who doesn’t love a homemade cookie? 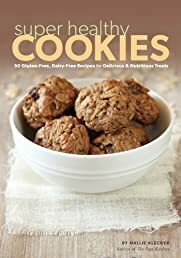 In Super Healthy Cookies, mouthwatering taste meets stellar nutrition in 50 recipes free of gluten, dairy, soy, and refined sugar. Emphasizing whole foods such as nuts, seeds, whole grain flours, and natural sweeteners, each and every recipe packs a healthful punch with big flavor and loads of antioxidants, fiber, healthy fats, and plant-based vitamins and minerals. Super Healthy Cookies offers smart strategies and no-fuss techniques for nutritious gluten-free baking that will yield irresistible treats every time, all with a healthier spin.